Chandra, (lit. “shining one”) The Moon, is one of the Gods and a most important planet in Vedic Astrology. 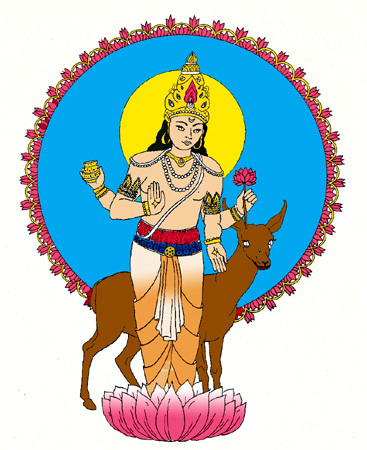 He is described as young, beautiful, fair; two-armed and having in his hands a club and a lotus. He rides his chariot (the moon) across the sky every night, pulled by ten white horses or an antelope. Although the antelope is the animal most commonly depicted with Him in iconography, the rabbit is also particularly sacred to him and all rabbits are under his protection. He is connected with dew, and as such, is one of the gods of fertility. As Soma, He presides over Somvar or Monday. As the Sun (Surya) represents the Self and its goal of no rebirth, the Moon represents the Mind and where we have come from. The Sun is the God or Deva, the Moon is the Goddess or Devi; the Sun is Shiva, the Moon is Shakti. Together they represent the duality of masculine and feminine, mind and body, day and night, will and love. The Sun is Divine Father and Creator; the Moon is Divine Mother and Creatrix. As the Sun rules Time, the Moon governs Space; the Sun rules Fire, the Moon rules Water. The Moon is the Lord of the Mind, closely aligned to the senses and the emotions, and those who worship him assiduously lose their diseases and become happy. Lord Shiva wears the Moon on his forehead, and some say this makes the Moon one-eight incarnation of Lord Shiva. The Moon is the father of Mercury, and Mercury is the father of a prestigious lineage of innumerable kings and warriors, which includes Lord Krishna. First and foremost, control your thoughts. The clouds of these thoughts are moving about in the sky of your heart. The clouds, as they move, will cover the sun called the intellect and the moon called the mind. It is said, Chandrama manaso jataha (the moon was born out of the mind). The moon reflects the mind’s nature. The intellect is the reflection of the sun. Both of them move about in the sky of the heart. Sometimes, our own thoughts form “dark clouds” – more so in the youthful stage. The “dark clouds” are water-borne, meaning they are associated with desires. When such “dark clouds” gather, the sun and the moon are hidden by them. It is only in the youthful stage you are troubled by an excess of thoughts. You will be drowned in them, literally, and will forget your very humanness. Hence, first and foremost, you have to remove those “clouds”. From where do these “clouds” come? They are formed on account of your sankalpas (resolutions) and vikalpas (indecisiveness). Hence, first and foremost, you have to control your thoughts. If you are able to do it, then your mind and intellect will shine brightly. The mind is a bundle of thoughts. When the thoughts and resolutions are controlled, it will be clean, like a placid lake. Light is the dominant force in the Universe; the moon reflects the light of the Sun. The forces of the Sun and the Moon or solar and lunar energies indicate the broader powers of light in projection and reflection, for all light comes from the Central Sun of all the Universes. Solar and lunar energies relate to the powers of the day and the night, which can stand for light and dark phases of all time cycles. Lunar energy reflects the magnetic or attractive power of light and is cooling, nourishing and calming. It is symbolised by the Goddess Lakshmi. Lunar energy in the mind in the broader sense represents the capacity for contemplation, reflection, feeling and attraction. 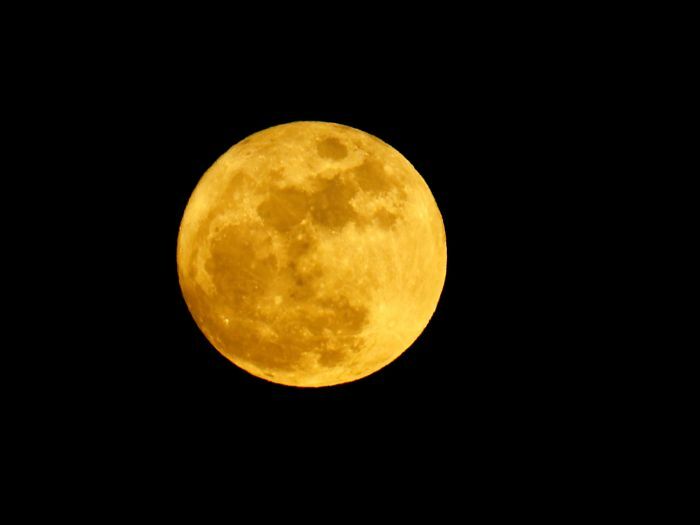 The Moon plays a significant role in Vedic Astrology. The goal of all incarnations is to ascend in consciousness so we may perceive our ultimate goal, awareness of our divinity within, moksha. An afflicted or debilitated moon cannot ascend in such manner and is restricted in its capacity to function. The moon is also used as an ascendant (Chandra lagna) for verification of chart readings, and readings where certain houses are found to be vacant. This is also used for marriage calculations and resolving dosha of Mars in matters pertinent to marriages. Unlike other planets in the birth chart, the Sun and Moon own one sign only (Cancer) and is Lord of the Fourth house. Chandra, the moon, is the presiding deity of the mind. He rules over the element water, journeys, manual arts, novelists, liquid-related businesses, matters related with maternity, agriculture, illnesses of the stomach and of the brain. He also rules over psychic ability and spiritual sensitivity. To learn the aspects of the Moon (Chandra), in your chart, seek an astrological reading with the Puttparthi Vedic Astrologer, Sai Bharathi and make payment thought Paypal.